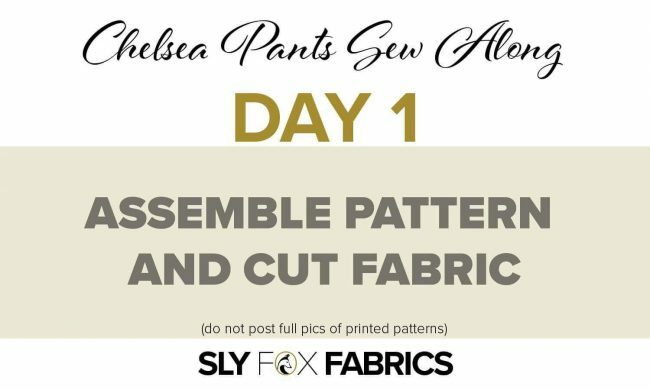 Welcome to day 1 of the Chelsea Pants Sew Along! I’m delighted to have you joining me over in Sly Fox Fabrics Sew Along Group (even if you’re just planning on lurking….I will do my best to change your mind!) for a whirlwind week of sewing shenanigans! Don’t have your fabric and supplies yet? Check out this post for more details! Don’t forget to subscribe to my blog and “Like” my page on Facebook to stay up to date with these fun events! If you enjoy Sew Alongs, check out the others I’ve done HERE. Note: this post contains affiliate links, which help me bring these videos to you!